Service: 1:00 pm Tuesday, July 17, 2018 at Central Church in Sioux Falls, SD. Visitation will begin one hour prior to the service at the church. David John Dancsisin, 73, passed away July 10, 2018. David John Dancsisin was born 2/26/45 to John and Marie Dancsisin in Passaic, NJ. 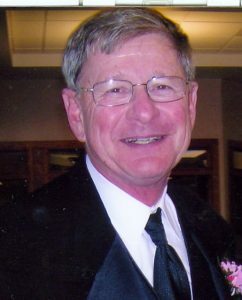 He attended East Patterson schools and graduated from East Patterson High School in 1963. He attended Tarkio College in Tarkio, Mo for 3 years. David joined the Army in 1966 and served in Vietnam for 15 months. He received an honorary discharge in 1969 and returned home to New Jersey where he began his lifetime career as a carpenter in the building industry. David met his lifetime love Marilyn Halva in 1971, and the two were married 1-6-1973. In 1975 the couple welcomed their son, Adam John. One year later the family moved to Harrisburg, SD. In 1978, the family grew with the addition of daughter, Erin Teresa. David built the family home in rural Harrisburg where they raised their children and where they resided until his death. He loved his family, especially his six grandchildren and would give them rides all over on the lawn mower. He was a selfless giver of his time and talents, and especially loved interacting with all ages of kids. He loved nature, gardening, and was faithful to feed the birds. He loved sitting on the deck or walking around the yard just enjoying God’s creation. He found joy in the little things in life. The foundation of who David was, came from his love of God. It truly did flow from him like a vibrant river. He was a principled man and stood firm on God’s word and let it shape his every thought. Survivors include his wife, Marilyn Dancsisin; son, Adam (Kristi) Dancsisin; daughter, Erin (Andy) Trefz; six grandchildren, Jonah, Carly, Eli Dancsisin and Isaac, Micah, and Lydia Trefz ; brother, Paul (Jan) Dancsisin; and sister, Ellen (Matt) DeMaria and numerous other relatives and friends. A memorial service will be held 1:00pm Tuesday, July 17, 2018 at Central Church in Sioux Falls, SD. Memorial may be directed to Central Church Youth Group, Harrisburg Food Pantry and Children’s Inn, Sioux Falls, SD. I am so sorry to hear of David’s passing. Although I didn’t have as much contact with the family as my younger brother and sister, I remember David, Marilyn, Adam and Erin very well and knew you all as a wonderful family. We are so sorry to hear of Dave’s death but rejoice that because of his faith in Jesus we will see him again in heaven. Hallelujah. You are in our prayers. Marilyn: praying for you and your family during this difficult time. May he rest in eternal peace. Love, hugs, and prayers.